The proteins present in the leaves which absorb light of different wave lengths are called phytochromes. Xanthium plants are grown under long days. They then are exposed to short days. The dark period of the short day is interrupted in the middle by light of various wavelengtas. 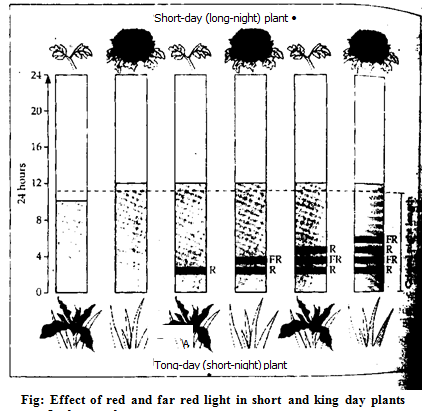 It is found that the red light (660 mu) is the most effective in preventing flowering of short day plants. However, if the dark period is interrupted by far-red light (730 mu) flowering is not affected. The plant continues to flower. The red light is given in the middle of the dark period. It is immediately followed by a flash of far red. Then the plant flowers. The far-red light is again followed by- red. Once again the plant fails to flower. –5. The alternating sequence of exposure to red and far-red can be continued a number of times Every time the effect of red is reversed by far-red and the effect of far-red is reversed by red. 6. The last installment of light has great importance. If the last installment is far red the plant flowers. If the last installment is red. then the plant fails to flower. Thus it is found that the red and far-red radiations are effective for flowering. These radiations must be absorbed by the plant. These are absorbed by certain pigments. Plants contain chlorophyll. carotenoids and anthocyanin pigments. But they do not absorb red and far-red radiations. Borthwick and Hendricks in 1959 were working in the U S Department of Agriculture at Maryland. They discovered a new pigment. It was named as phytochrome. Siegelman and Firir in 1964 extracted and purified phytochrome from etiolated maize leaf. There are two forms of phvtoehrome. These are Pr and Pfr. These two pigments differ in their absorption peak. I. Phytochrome red (Pr): It absorbs maximum light in the red region of the spectrum. It has wavelength of 660p Pr is the inactive form. 2.Phytochrome far red (Pfr): It has the absorption peak in the far-red region at 730 p. Only Pfr phytochrome is physiologically active. 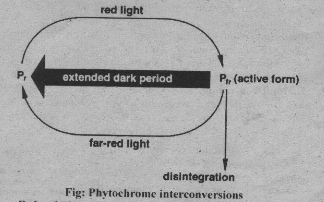 Photoconversion: The Pr phytochrome absorbs red light. It is converted into Pfr. Similarly when pfr absorbs far red it is converted to Pr form. This is known as photoconversion. Photoeonversion is very rapid. It is completed within 1-4 minutes. 2. Thermal conversion: Pfr spontaneously converted into Pr in the dark. This method of conversion is very slow. It takes a few hours. It depends on temperature. Therefore. it is called thermal conversion.Pr form does not show thermal conversion. There is following mechanism by which phytochrome controls the flowering in plants. Pfr undergoes thermal conversion in dark. The Pfr is slowly converted into Pr from when 8 1/2 or more dark period is given. Now Pfr is disappeared. Its inhibition is also lost. Therefore. the plant flowers. Conversion of Pit Pr is not completed if dark period is less than 8 ½ hours.Hence the plant fails to flower. Photoconversion is also possible. When the dark period is interrupted by a brief flash of red light in the middle. whatever Pr is produced is converted back to Mr. Hence red light inhibits flowering. If red light is followed by far-red, Pfr is again converted into Pr. Therefore, the plants flowers. Long day plants produces flower in the presence of Pfr. Pfr also accumulates at the end of the light period in long day plants. Pf.r start a series of reactions. It finally produces flower. Thus Pfr causes flowering in long day plants. Thus Pfr should not be allowed to comers into Pr. Pr inhibits flowering in long day plants. Pfr can convert into Pr in dark. Therefove, plant should be given less darkness than critical time. Hyoscyamus plant is exposed to 10 1/2 hours of light and 13 1/2 hours of dark. Conversion of Pfr to Pr is not completed in the dark. Therefore, the plant flowers. If the dark period is more, then Pfr disappears. Therefore, flowering is inhibited. If a flash of red light is given. Pr is converted into Pfr. Thus Pfr is restored. Hence red light causes flowering.